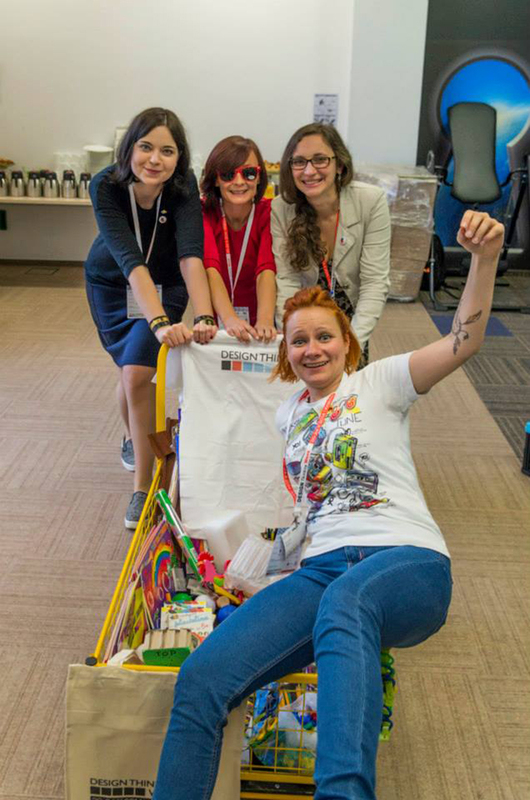 The year I started my adventure with design thinking was the first year that Design Thinking Week was organized, and not only in Krakow but many cities across Poland. Design Thinking Week is a week-long festival when people from various backgrounds share their knowledge and usage of design thinking. One common theme each year unites the cities and shows the power of collaboration and communication across borders. Workshops, social projects with local people, lectures, and more happen during the festival, where attendees can learn and practice the newly-acquired knowledge. To this day (April 2018), Krakow held three editions of the festival, all organized by my NGO alma mater, Innovation and Creativity Lab Foundation (Fundacja Laboratorium Innowacji I Kreatywności, FLIK for short). We always search for actual themes and local organizations that would best benefit from changes that design thinking offers. Human-centered all the way! It was an exhausting, but inspiring endeavor that will always stay in my memory (and my portfolio) as a successful week of innovation and motivation. I did organize some events previously, such as university culture days, scout trips, and more. But this the first business adventure that was coordinated across Poland and help various activities at the same time (additionally, some of which I was a mentor of, as well as the organizer!). It’s incredible how such actions bring people together. We learned about how we work, what we like and how to adjust the organization, so each person does what they want. We had some mishaps, of course, but they were nothing in comparison to the positive, exhilarating, and uplifting atmosphere of the entire event. Evening workshops – the idea behind this project was to introduce people to the five stages of design thinking, but at a slower pace; each stage had its day and approx. 4 hours were devoted to discovering, understanding, and experiencing each stage. It was one basic group that moved through the stages, and they worked on one problem through the entire week. Creative workshop for kids “You too can be an adventurer!” – this project was for kids only. The workshop was designed to use the natural curiosity and inquiring mind of young kids, cultivate their willingness to ask questions and attempt to build their ideas. Also, it offered a way to structure their findings and build easy prototypes, in an easy-to-understand package. Creative breakfast with the keynote speaker, Katy Kavanaugh – this express creative workshop allowed people to get to know the design thinking method in action, while they worked on a problem related to all of them. Katy also gave a short lecture about how time and space influence design and design thinking. Workshop “Krakow Thinking” – few design thinking trainers from Krakow got together with citizens of the city to utilize their potential, and the design thinking methodology, to address some of the problems of Krakow’s city center. You are also invited to hear what was the prevailing opinion of organizers, guests, and attendees of DT Week Krakow 2014 in this episode of an independent YouTube series called Krakow Startup TV.